Amnesty International issued a statement on Sep. 16 condemning regime violence in what has been known as China’s “democracy village,” after police arrested scores of villagers and assaulted five Hong Kong reporters. “Amnesty International calls on the Chinese authorities to immediately and unconditionally release those villagers of Wukan village who are detained solely for exercising their rights to freedom of expression and peaceful assembly,” it said. The coastal village, in the southern province of Guangdong, came to the world’s attention five years ago with its daring protests against corruption and illegal land seizures. It was noted for electing a leadership that answered to local interests instead of those from higher authorities. The Wukan confrontation broke out on Sep. 13, after thousands of riot police entered the village at midnight and detained 13 local activists, charging them with gathering a crowd and disrupting public order, according to Hong Kong’s Now TV. Dozens of residents were injured as police fired tear gas and rubber bullets. Villagers have since estimated there have been a total of over 70 arrests. Reports in the mainland on the Wukan crackdown have been reduced to nothing as local authorities have barred overseas reporters and offered rewards of 20,000 yuan ($3,000) for clues of “foreign forces” hiding in the village. Five Hong Kong journalists attempting to interview protesters were detained and interrogated on Sep. 14. Two Ming Pao reporters were called thieves and punched to the ground, while another reporter from South China Morning Post was slapped on the face, according to the Hong Kong newspaper Ming Pao. All five were asked to sign a paper promising to do no further “illegal interviews” in the region. 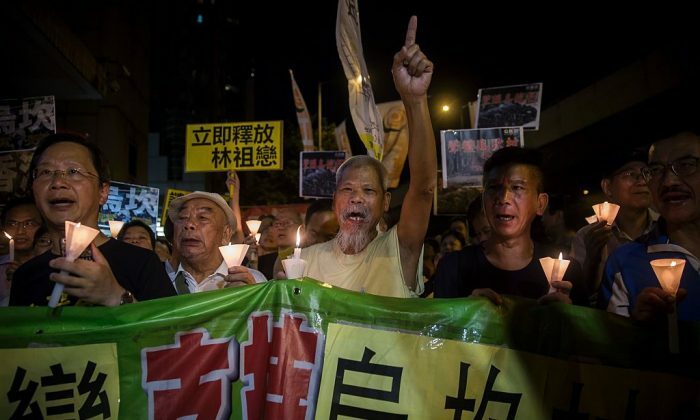 The Hong Kong Journalists Association and Ming Pao have protested the rough handling in public statements, calling it a suppression of freedom of the press. After the protests in 2011 that claimed the world’s attention, Wukan become a rarity by holding democratic elections in a state controlled by the Chinese Communist Party. In moves that anticipated the recent arrest and trial of Lin Zulian, the power of the villagers appeared to have been undermined in 2014, as two individuals who helped lead the 2011 protests and then were elected to office were arrested and tried for bribery. Villagers have taken to streets since the village chief Lin Zulian was arrested. The 72-year-old was seen in a televised confession that convinced few, and sentenced on Sept. 8 to three years in jail.